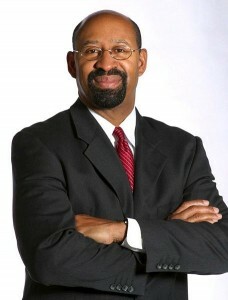 Phila Mayor Michael Nutter has emerged as a top surrogate for the Obama campaign. Update: Morning Call has reported that some of Pennsylvania’s prominent political Dems, including former Gov. Ed Rendell, will be at a Wawa gas station outside Quakertown to meet Mitt Romney as he makes his way across the state as part of a six-state, five-day bus tour. Rendell will be joined by State Treasurer Rob McCord, State Rep. and Auditor General hopeful Eugene DePasquale (D-York), former Congressman Patrick Murphy and Bucks County congressional candidate Kathryn Boockvar. The move may come as a shock, considering some of Rendell’s recent comments giving a less-than-glowing review of Obama’s performance. He said that Obama did not work hard enough to get things done in Congress, and that Hillary Clinton would have been more effective. While having a political force like Rendell back on Obama’s side is good for the campaign, Phila Mayor Michael Nutter, as well as PA native Vice President Joe Biden continue to be strong forces for the President. The two spoke at a press conference today where Nutter reiterated Obama’s campaign slogan of moving forward. Biden discussed job creation as well, saying that Romney’s plan would build government from the top down, whereas Obama would build from the middle class outward. The pair also touched on a recent gaffe made by Romney, who said that Obama wants to hire more firemen, more police officers and more teachers at a time when government needs to be cut back. Romney ironically made the comment when responding to Obama’s the “private sector is doing fine” gaffe. Nutter and Biden said there is a need for more of those jobs, along with rebuilt infrastructure and less foreign oil dependency. Also today, it was announced that Pa. Governor Tom Corbett will be joining Mitt Romney on his first tour stop through Pennsylvania when the presidential hopeful visits the historic Cornwall Iron Furnace Saturday afternoon. With a cross-state Romney tour looming, the Pennsylvania Democrats have sounded the alarm bells. The announcement of Romney’s visit falls two days after a poll was released suggesting Romney is starting to pick up momentum in Pennsylvania. It was previously believed that Romney wasn’t focusing on the state, given the lack of TV ad buys, but with this tour the Romney campaign could be hitting the gas in what could be a swing state. In response, state Democrats are on the offensive to remind voters of Romney’s gubernatorial record as well as progress that has been made thus far under the Obama Administration. State GOP Executive Director Mike Barley said that, despite the claims Obama makes about progress, Romney brings something to the table that Obama can’t. The PA Dems also acknowledged the emergence of Philadelphia Mayor Michael Nutter as a top surrogate to the Obama campaign. Burn said he believes that having someone like Nutter on the team is beneficial to the Obama campaign because Nutter deals with major issues in Philadelphia and pushes policies similar to President Obama’s forward. Other top surrogates for Obama in the state include Allentown Mayor Ed Pawlowski, Phila D.A. Seth Williams and Rep. Allyson Schwartz (D-Montgomery). Meanwhile, back in Philly, Republicans seeing that Nutter is new major mouthpiece, they’re furiously mounting up 2nd Congressional Candidate Robert Mansfield, (an already potent Romney supporter) to take on a potentially vulnerable Chaka Fattah while giving Nutter headaches in his own backyard. The party knows the realities, but sees a rare opportunity to be competitive. It dramatizes the Mormons’ anti-federal government temperament and demonstrates how their superiority complex manifests as racism, sexism, and jingoism on the ground. It also shows the similarities between Islam and Mormonism and reveals the secrets of Mormon Mind Control. Everyone should read The Assassination of Spiro Agnew. Corbett should take Romney to see the schools he’s closing down or maybe the pollution from fracking, or maybe the big pile of money he gets from the oil/gas industry to screw over PA residents. If I had a member of the ten worst Governors list offering to help me, I think I wouldn’t be available when he called. Corbett will add to the circus atmosphere as soon as they step off the bus! Our Mayor’s AVI tax hike attempt ended up being Nutter’s Obamacare. Nutter is a classic tax and spend old school machine Democrat and it’s a gift to Romney that he represents what Obama wants to do. Under Nutter, overdue property taxes ballooned to $515 million, yet he RAISED taxes, both property and business. Sign the petition to get him to collect. But please, is this kind of mismanagement any reference? The Democrats have blinders on. Give them the microphone and allow them to continue to speak…PLEASE! The problem was not our lack of regulations, our problem was the selective enforcement of regulations. Our real problems began with the Riegle-Neal Interstate Banking and Branching Efficiency Act of 1994, decimating state banking oversight of multi-state banking institution, including depository requirements, placing oversight under federal control. Of course, then the same institutions were required with the Community Reinvestment Act which was super-sized and enhanced during the Clinton Administration; first to use as a tool to approve charters and secondly as the lynch pin for Democratic Support of the Financial Services Modernization Act of 1999. The mass failures of the Securities Exchanges Commission and Congressional Oversight Committees had nothing to do with the absence of regulation but rather the failure to act in a manner consistent with the Acts in place that do regulate Wall Street and Banking. Mayor Nutter has done a decent job considering the many problems the wonderful city of Philadelphia faces – many of which were inherited. Many would recognize this fact, if it weren’t for the fact he was a democrat. Keep up the good work Mayor Nutter – and I’m glad to hear you are supporting Obama! I can’t believe I voted for this idiot. Recent homebuyers have zero equity in their homes and his sloppy push towards the implementation of Actual Value assessments using (with millage rates int the 1.825% range) will slash their property values . So he’s trapping them. They won’t be able to sell their homes without taking major losses or going to short sale. And many won’t be able to stay because they can’t afford to pay outrageous tax increases in the 400%-600% & even 1000% range. Get ready for foreclosures and wave sales in the City of Brotherly Love. It’s over. All in a day’s work for America’s mayor. Hey Mayor Nutter: You can’t go out one day cutting the ribbon at Shake Shack in Philly and the next day head to D.C. and speak out against sugar without being called a hypocrite. Now, you’re the attack dog for Obama against Romney. Love that you think you can lecture Romney on what it takes to run the country when you can’t even run the City of Philadelphia. What happened to “A New Day, a New Way?” Advise: Rather than going on tour, why not (1) work on reducing the murder rate, (2) get concessions from the public sector unions, and (3) collect back taxes from scofflaws.